The composition of the jury that tried and convicted Roger Casement. 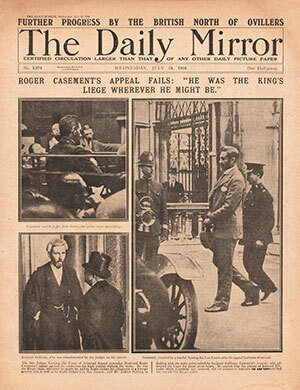 Once the authorities had decided to try Roger Casement in the English civil courts, his solicitor, George Gavan Duffy, set about trying to secure defence counsel. This was not straightforward, however, as a number of leading barristers refused to represent him. To be accused of treason in the middle of the Great War, particularly as a knight of the realm, was too odious for many. Eventually, Duffy persuaded his brother-in-law, Alexander Martin Sullivan, to take the case. Well established as a barrister and Crown serjeant in Ireland, Sullivan considered this his big opportunity to make a name for himself in English legal circles. He was encouraged by Chief Baron Palles to take the case, and agreed to do so provided that he was well paid. Casement was to be tried at the bar of the King’s Bench division of the High Court in London, before both a jury and a panel of three judges. As in any criminal prosecution, obtaining a sympathetic jury would be advantageous. Because this was a trial for treason, as opposed to a felony or misdemeanour, Casement was entitled to a copy of the jury panels ten days before the trial. 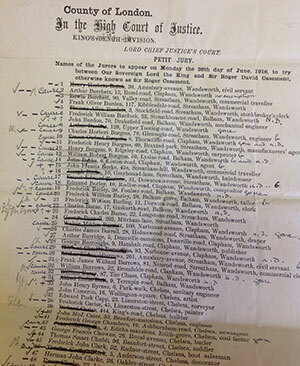 There were two panels, listing the name, address and occupation of 150 jurors from London and Middlesex. Once Casement’s legal team received these jury panels, they set about trying to ascertain which potential jurors were most likely to be sympathetic to Casement in particular, and to the Irish cause more generally. According to a note scribbled by Charles Gavan Duffy, each potential juror was ‘approached by a man, not directly connected with the Casement trial, ostensibly to ascertain if they would favour an independent candidate at next parliamentary election, and so ascertain their outlook’. Frederick Edward Woolls, William Alfred Cox and Archibald William Scales were enlisted to knock on doors in Wandsworth, Ealing, Chelsea and other parts of London, to try to pin down the potential jurors’ political views. Sometimes, despite calling to their houses several times, they did not manage to speak to the jurors themselves but chatted with their wives or neighbours. Having spoken to as many of the potential jurors as possible, Casement’s lawyers annotated the two jury panels, marking names with pluses, minuses or question marks, depending on the juror’s position on the political spectrum. Some potential jurors expressed moderate political views. These included Hyman Saunders, a tailor described as ‘very moderate’ and ‘very dissatisfied with the government’. Others appeared to take an impartial or even sympathetic position regarding Casement and the Irish cause. The wife of George Carey, a clerk from Middlesex, was interviewed, and she indicated that her husband was a strong liberal who thought that ‘Ireland has been ill used too long and is of opinion that America should, as there is so much Irish blood there, interfere and protect. She said she and her husband often talked the matter over.’ Carpenter Ernest Charles Scales, a Liberal, was described as ‘very clever and intelligent’. In the course of his interview he expressed pity for Casement, and looked upon him ‘as a brilliant man who has been led astray’. Many jurors expressed their views as regards the government, politics, Germany and the war, and were variously interpreted by Casement’s lawyers as being either favourable or unfavourable. Now that Casement’s legal team knew something about the prospective jurors, they could try to keep those who were very unsympathetic or biased out of the jury box. It was common practice in Irish criminal trials for defendants to exercise (sometimes to an extreme extent) their traditional right to challenge jurors, either ‘for cause’ or ‘peremptorily’. Parallel to the defendant’s right to challenge jurors was the Crown’s right to order undesirable jurors to ‘stand aside’ without having to state reasons. While the defendant was entitled to a limited number of challenges without cause, the Crown’s power was unlimited. In Ireland, jury-challenging was an integral part of the criminal trial process, and often proved controversial if, for example, adherents of a particular religion or political viewpoint were excluded from a jury. This was in stark contrast to England, where the challenging of jurors was almost unknown by the early twentieth century. As Sullivan later noted in his memoirs, ‘No one who practised in an English court had ever seen a jury challenged. No one in an Irish court had ever seen a jury sworn without challenge.’ A 1913 Departmental Committee on English juries had noted that challenges to individual jurors, known as challenges to the polls, were quite unusual. The committee noted that formal challenges tended not to be used any more but that a juror was asked to stand by when anyone objected to him. It is unsurprising that Sullivan, steeped in the traditions of the Irish bar, exercised the right to challenge so vigorously. Because this was treason, Casement was entitled to 35 peremptory challenges, as well as unlimited challenges for cause. At least 37 jurors were challenged in total over the course of an hour or so. The prosecution, it would seem, had not carried out the same level of research into the prospective jurors and was unprepared for this extensive jury-challenging. Sullivan remarked that the attorney general, ‘[a]larmed at my apparent intimate acquaintance with the panel, eventually … ordered to “stand-by” a number of persons because I did not challenge them’. In other words, the prosecution presumed that any juror not challenged by the defence must be sympathetic to Casement and thus undesirable from the Crown’s perspective. In some instances the Crown appeared to challenge jurors merely because they had Irish connections. One of the men thus challenged was highly indignant at this, being a staunch Orangeman and a supporter of Carson and Smith. It took almost a whole morning to empanel the jury. Those who had expressed strongly anti-Casement views were challenged for bias and the jury was, on balance, composed of relatively moderate men. Most of them had been deemed favourable by the defence. Montgomery Hyde, who later wrote a book about the trial, described them as ‘a typical collection of lower middle-class Londoners’. A number of them were Liberals, such as John Charles Watts, a warehouseman, and Albert Sydney Ansley, a bank clerk who had been a Liberal for many years but had recently developed socialist views. Both were marked as favourable by the defence. Jurors who claimed to be radicals were also considered favourable, such as clerk Albert John Abbott and leather merchant Albert George Scopes, who was very moderate in his views. Frederick Thomas Wheeler, a shipping clerk, was a conscientious objector and firmly opposed both military service and capital punishment. He had been marked as very favourable by Casement’s team. There were a couple of moderate Conservatives sworn onto the jury, such as Herbert James Scoble, a clerk who had expressed anti-German views. Conservative coachman William Cole was marked as favourable by the defence. He professed not to understand Irish matters and was of the opinion that the government did not understand the Irish. Some jurors had refused to state their position on the political spectrum, such as mechanical engineer John Burden. The defence marked him as being possibly favourable. William Bowers Card, a Wesleyan baker, claimed to have little interest in politics. He said that he had always voted Conservative but liked the idea of an independent candidate, and was marked as favourable. Ernest William West, a schoolmaster, had not been at home when the investigator called. He was believed, however, to be a Liberal and was marked as favourable by the defence. Richard Charles Scantlebury, an agent, was a declared Liberal. No marks appear beside his name on the jury panel but it can be presumed that he was considered favourable to the defence. Hyman Saunders, a tailor, was described as ‘very moderate’ and ‘very dissatisfied with the government’, and was considered to be very favourable. Although it is clear that Sullivan had managed to get as sympathetic a jury as was possible under the circumstances, these attempts to influence its composition had no effect on the outcome. Casement was found guilty and sentenced to death. During his speech from the dock, Casement lamented the fact that he had not been tried before an Irish jury: ‘With all respect I assert this court is to me, an Irishman, not a jury of my peers … I have a right, an indefeasible right … to be tried in Ireland, before an Irish court and by an Irish jury.’ Following his unsuccessful appeal, he was hanged on 3 August 1916. Niamh Howlin is a lecturer/assistant professor at the Sutherland School of Law, University College Dublin. C. Gearty, ‘The Casement trial in its legal context’, in M.E. Daly (ed. 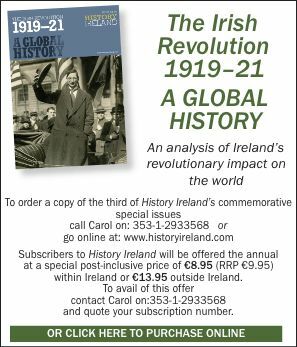 ), Roger Casement in Irish and world history (Dublin, 2004). G.B. Shaw, ‘The Roger Casement trial’, The Massachusetts Review 5 (2) (1964).